Objective: To determine the prevalence of major neurological disorders in children less than 10 years of age. Materials and Methods: The study was conducted in the framework of a population based, single centre, cross-sectional study at Ranbir Singh Pura town, 22 km south-west of Jammu city. Results: Eight cases of active epilepsy with a crude prevalence rate of 202 (95% confidence interval [CI] 180-220), five cases of Febrile seizures with a crude prevalence of 126 (95% CI 110-140) and eleven cases of cerebral palsy with a crude prevalence rate of 277 (95% CI 245-309) per 100,000 were found. Very few cases of other major neurological disorders were found. The prevalence rate of these disorders is estimated at same level as for other disorders such as - Post-meningitic sequelae, Infantile hemiparesis, Spinal deformity and Tic disorder is at 25 (95% CI 15-34) per 100,000. Interpretation: On the basis of the data obtained, the present study provides some valuable data on common neurological diseases among children in RS Pura town of Jammu district of Jammu and Kashmir. Objective: The etiology and pathogenesis of migraine and other types of headache are still under discussion. The aim of this study was to investigate the prevalence of migraine and tension-type headache and its association with demographic variables among schoolchildren. Materials and Methods: A cross-sectional study was performed on 930 school children (aged 12-14 years) through cluster sampling method. International Headache Society criteria were used for diagnosis. Descriptive statistics and logistic regression were used for data analysis. Results: The prevalence of migraine headache was 12.3% (95% CI: 10.2-14.4) and tension-type headache was 4.2% (95% CI: 2.9-5.6). The factor associated with migraine in multivariate analysis were age and sleep disturbances. Conclusions: Migraine is common among school children, although it may be under-recognized. Because children with migraine and tension-type headache have a high prevalence of sleep disturbances, they should always be evaluated for the presence of sleep problems. GM2 gangliosidosis variant B1 is a very rare lysosomal disorder. As per our knowledge, to date, only one article depicting the magnetic resonance imaging (MRI) findings of GM2 gangliosidosis variant B1 is available in the literature. We are the first to describe the neuroradiological findings in an Indian patient diagnosed with GM2 gangliosidosis variant B1. Sturge Weber syndrome is characterized by unilateral facial nevus with a tram track appearance on CT scan. However different variants have been described. 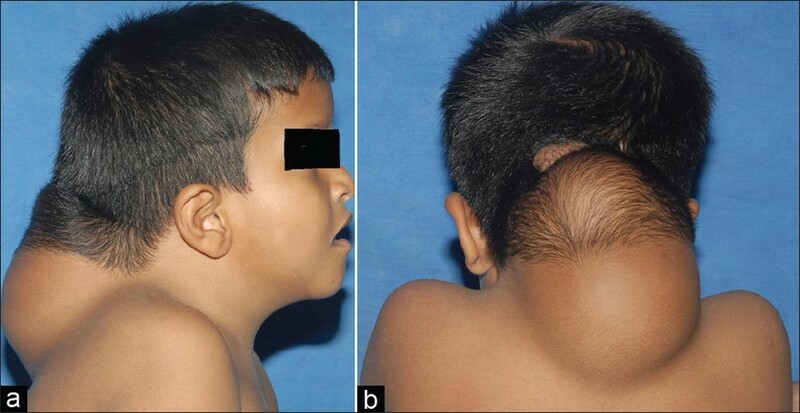 We report one such variant in a 14 months old child with bilateral facial nevus and bilateral curvilinear calcification. There was also global development delay and early onset of seizures reflecting the severe bilateral cortical changes. Chiari type III is the rarest of the Chiari malformations and is usually associated with high morbidity and mortality. 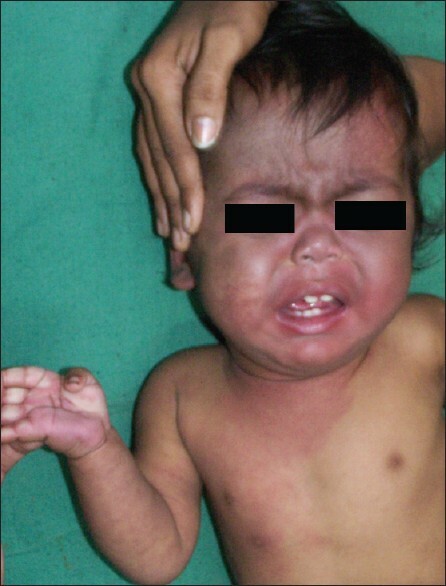 Treatment consists of primary closure of the encephalocele with or without cerebro-spinal fluid (CSF) shunting. In our case, the patient was treated with ventriculoperitoneal shunt followed by excision of the encephalocele. We propose that large encephaloceles should be treated with CSF shunting prior to repair of the sac so as to achieve optimal result. Respiratory distress in an infant is a common cause of admission in neonatal intensive care facility. Obstructive lesions of the airway constitute a minority of problems in the new born but present a diagnostic challenge. 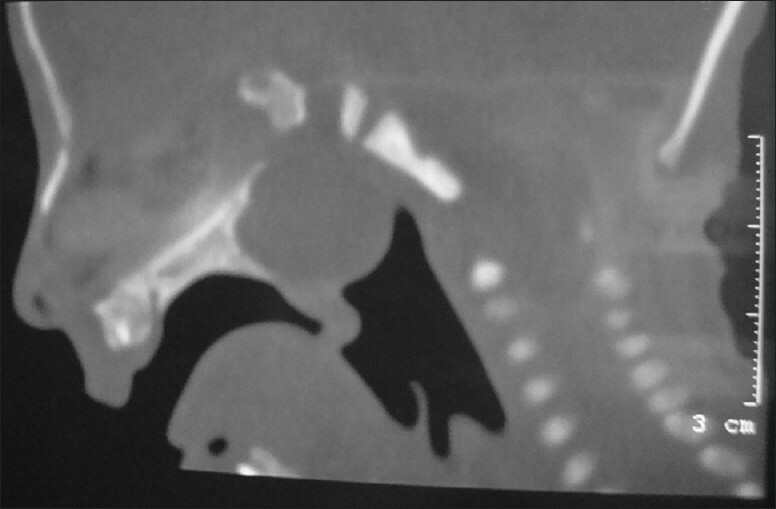 We present a 30-day-old male infant admitted with respiratory distress who was diagnosed to have an oropharyngeal cystic mass which on further evaluation by computed tomography and magnetic resonance imaging revealed a transalar transsphenoidal meningoencephalocele herniating into the oral cavity through a congenital split palate. The patient was operated successfully using a transpalatal approach leading to complete resolution of respiratory distress. 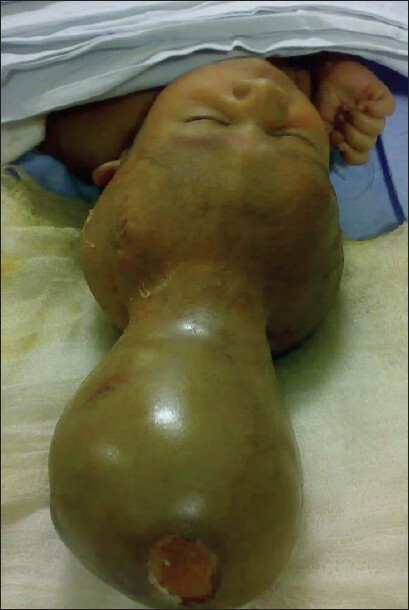 Iniencephaly is a rare neural tube defect characterized by extreme retroflexion of the head with the absence of neck due to spinal deformities. The important features that help us to diagnose a case of iniencephaly are occipital bone deficit leading to enlarged foramen magnum, fusion of malformed cervical and thoracic vertebrae, and upward turned face with chin continuous with chest because of the absence of neck. 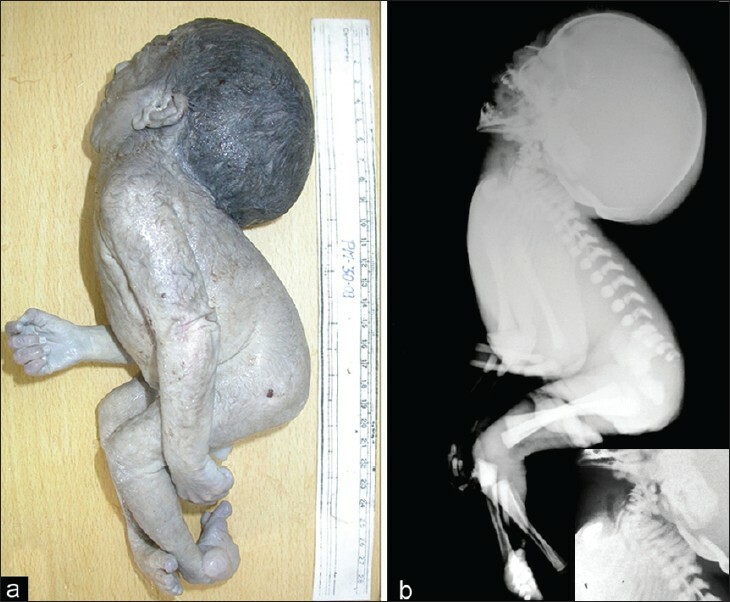 The differential diagnoses include anencephaly with spinal retroflexion, Klippel-Fiel syndrome, nuchal tumors such as teratoma, goiter, and lymphangioma and Jarcho-Levin syndrome. 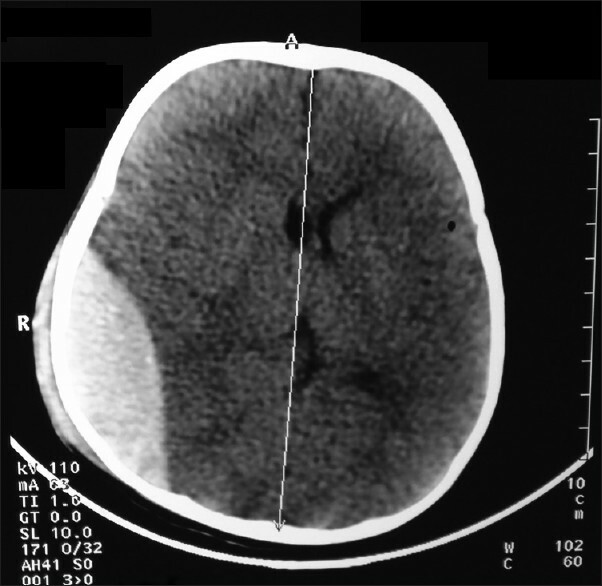 Previously many case reports on radiological features of iniencephaly are published, but there are very few articles on necropsy findings and differential diagnosis. 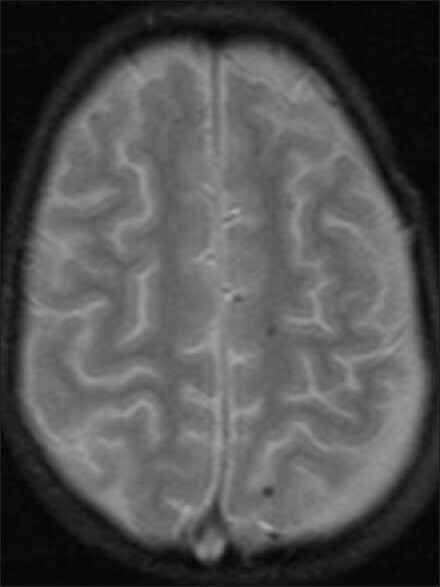 In the present case we have discussed in detail the necropsy findings of iniencephaly clausus with special reference to differential diagnosis. Congenital myasthenic syndromes are a group of rare genetic disorders affecting neuromuscular transmission. A high index of suspicion is required as clinical manifestations can be variable and nonspecific. 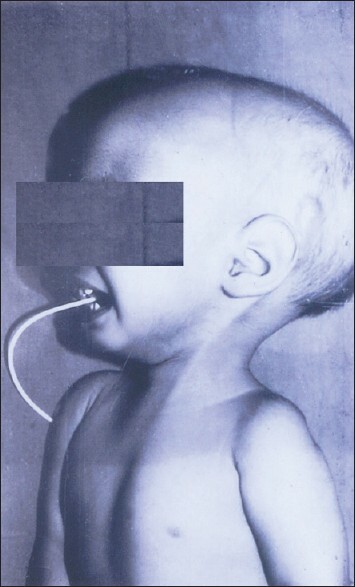 Clinical phenotype includes arthrogryposis, respiratory crises, facial deformities, and weakness. With the availability of molecular genetics, this group of conditions can now be more clearly delineated and targeted treatment can be initiated. 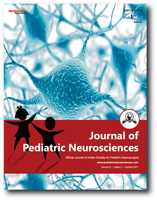 We describe three children who presented with bulbar difficulties and had Cholinergic receptor, nicotinic, and epsilon or receptor associated protein of the synapse mutations. Isolated syncope is a rare manifestation of seizures in children and it is a poorly localizing sign in the evaluation of seizures in children. Many times, such episodes are mistaken as primary cardiac dysrhythmias and we present herewith one such case in a child, who succumbed to the illness despite treatment. Cerebral venous thrombosis is a rare form of stroke in childhood. 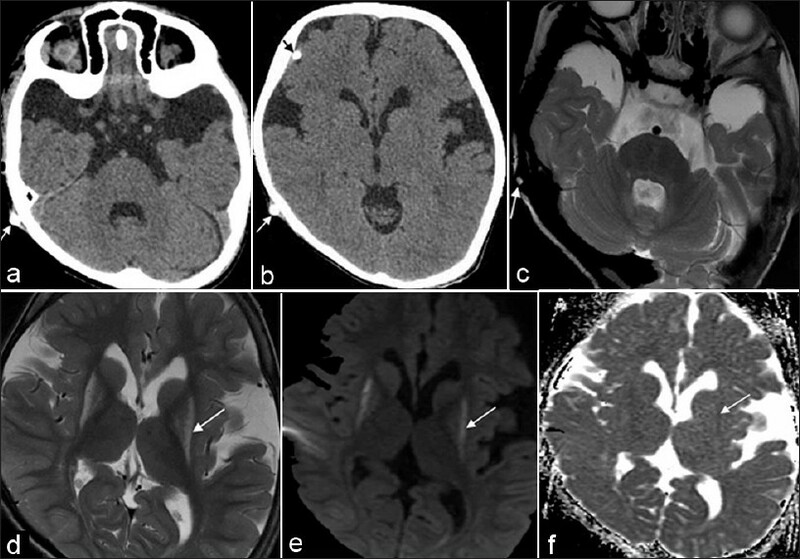 Increased intracranial pressure is a well-defined complication of cerebral venous thrombosis but obstructive hydrocephalus as a presentation finding of cerebral venous thrombosis is rarely described. 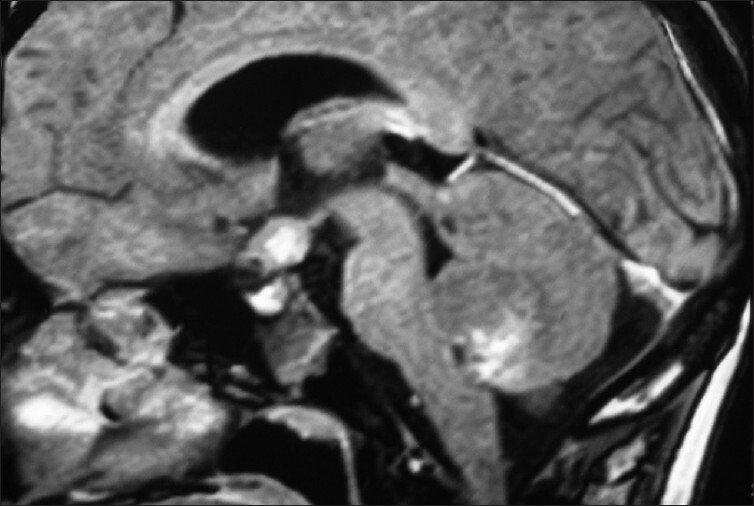 A child case of cerebral sinus thrombosis presenting with obstructive hydrocephalus and management of clinical condition is presented with discussion of reported cases and treatment recommendations. Spontaneous spinal extradural hematoma is a rare clinical scenario which may be secondary to a variety of etiologies. Spinal epidural hematoma is an extremely rare complication in hemophiliacs. It usually runs an acute course often leading to rapid onset of neurological deficits. MR imaging is the diagnostic modality of choice and early, prompt treatment will often yield fruitful results. We report a case of spontaneous spinal EDH in a 5-year-old male child with Hemophilia B, who was managed conservatively and was doing well at last follow-up, 2 years after treatment. The authors discuss the role of factor replacement therapy vis-a-vis surgery in such a scenario. Pituitary tumour have a wide way of presentation. Epistaxis due to pituitary adenoma has been rarely reported. There is no report of bleeding from nose as clinical first presentation in a child. 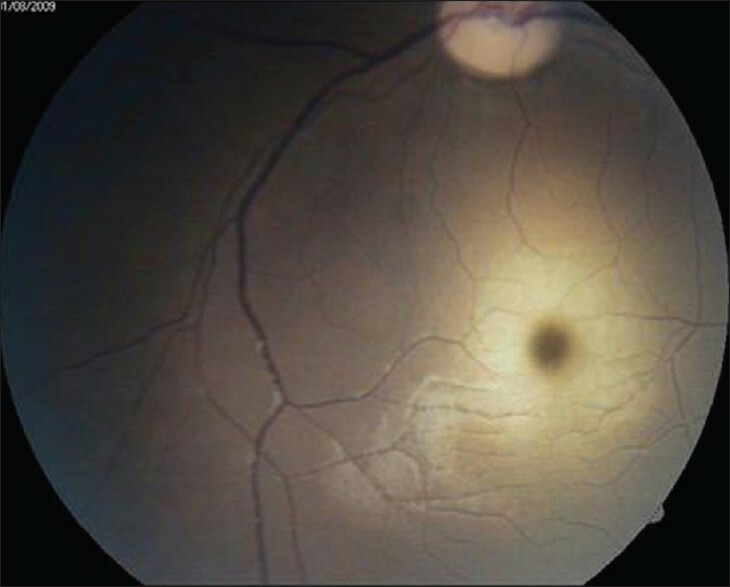 We report the first case in literature where a child had epistaxis for eight months before deterioration of vision. He was found to be having a invasive prolactinoma with normal prolactin levels. Reversible posterior leukoencephalopathy syndrome is characterized clinically by headache, abnormalities of mental status, and visual perception and seizures. 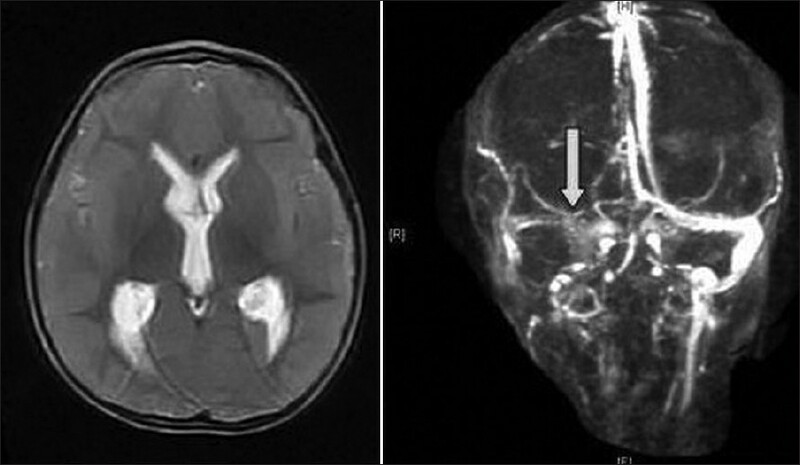 We report a rare case of acute encephalopathy following intravenous immunoglobulin treatment for Guillain-Barré syndrome in whom posterior reversible encephalopathy syndrome developed without severe hypertension. Jarcho-Levin syndrome (JLS) is a type of segmental costovertebral malformation. It is a congenital disorder characterized by a variety of vertebral and costal anomalies. Only four cases of Jarcho-Levin syndrome with diastematomyelia have been reported in the literature. We report the fifth case of Jarcho-Levin syndrome with diastematomyelia and review the literature. A one-and-half-year-old male child born of full-term normal delivery was brought with complaints of progressively increasing weakness in lower limbs with inability to stand since 1 month. 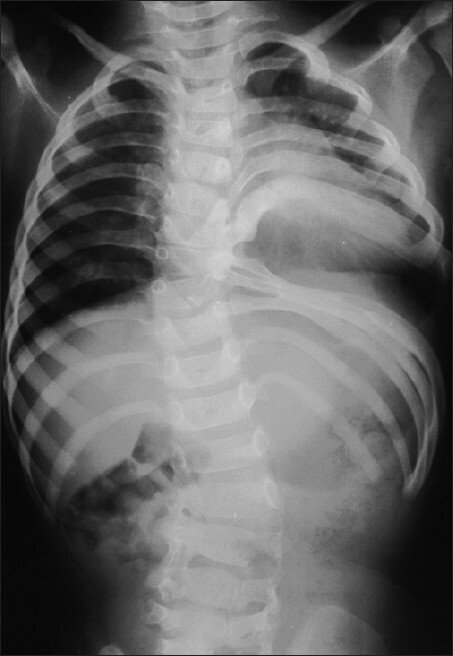 Radiological examination revealed irregular fusion of ribs, spina bifida, and diastematomyelia at L2-L3 vertebral level. The patient underwent L1 to L3 laminectomy. A large bony spur was identified and excised with microrongeurs. 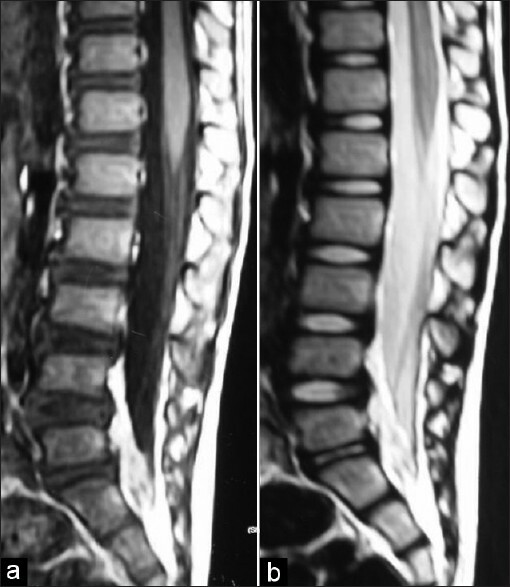 Spondylocostal dysplasia may be associated with diastematomyelia or other surgically correctable occult intraspinal anomalies which may be diagnosed in early asymptomatic stage by magnetic resonance image screening of spine. Guillain-Barre syndrome (GBS) is a common cause of acute peripheral neuropathy and is characterized by hyporeflexia or areflexia. Hyperreflexia has been rarely reported with acute motor axonal neuropathy. A 10-year-old boy presented with asymmetrical weakness of upper and lower limbs and change of voice. Weakness progressed in the hospital with involvement of multiple cranial nerves, preserved deep tendon jerks with extensor plantar, and normal abdominal reflexes. He was treated with IV immunoglobulin and IV methylprednisolone. He was able to walk with support with normal voice at the time of discharge. GBS should be a differential diagnosis in patients with acute quadriparesis even if there are preserved deep tendon reflexes. 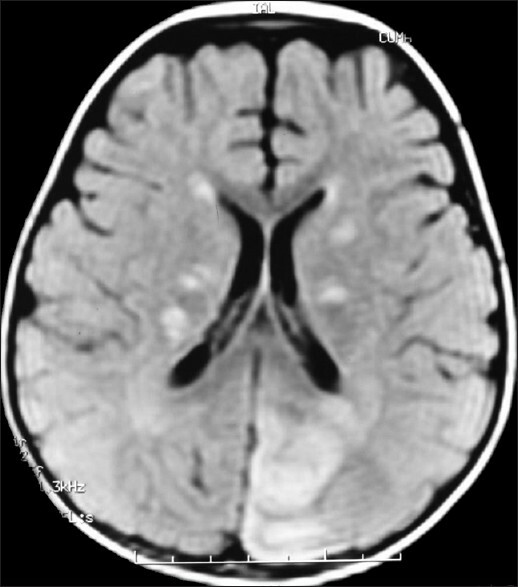 Two siblings born of a consanguineous marriage with history of neurologic deterioration were imaged. 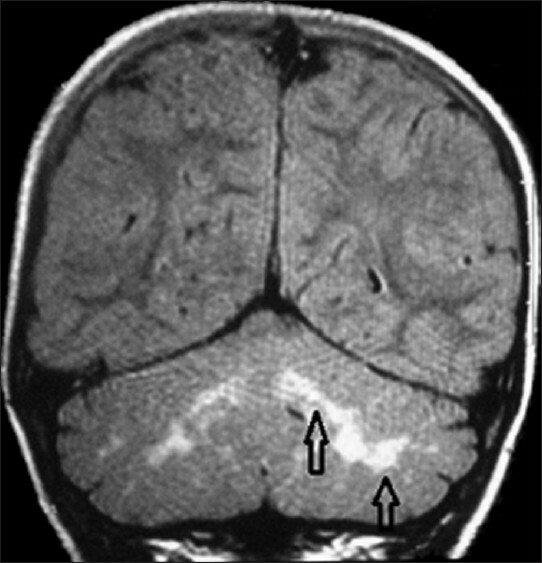 Imaging features are classical of glutaric aciduria type 1 (GA-1), acute (striatal necrosis) stage in younger sibling, and chronic stage in older sibling. 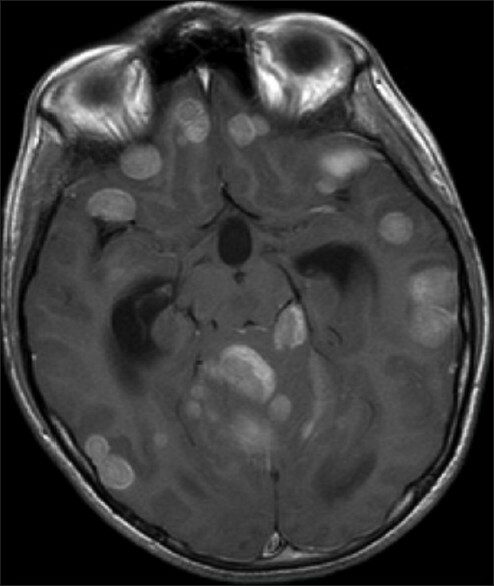 GA-1 is an autosomal recessive disease with typical imaging features. Greater awareness about this condition among clinicians and radiologists is essential for early diagnosis and prevention of its catastrophic consequences. Striatal necrosis with stroke-like signal intensity on imaging correlates with clinical stage of patients. There are several case reports of complications of ventriculo-peritoneal shunt. Extrusion of the peritoneal end of the shunt through mouth is extremely rare. There are few case reports. We are reporting one such case. A 1-year male child was admitted with the peritoneal end of ventriculo-peritoneal shunt coming out through mouth since 6 hours after an episode of vomiting. He was conscious and had no neurological deficits. The anterior fontanelle was depressed. There was no infection. The peritoneal end of the shunt was removed through the mouth. Shunt revision was performed. The patient was discharged 10 days after the revision without any complications. At 1-year follow-up the patient is doing well. Possible mechanisms of bowel perforation are discussed. Pulling the peritoneal end through mouth is probably the best way of management as small spontaneous gut perforation seals off spontaneously. It also decreases the possibility of infection, other morbidities, and hospital stay. Management of patients with medulloblastoma presenting with multiple metastasis in subarachnoid space preoperatively is unclear. An 11-year-old boy presented with vermian medulloblastoma with an unusually long segment cervico-dorsal lesion and suprasellar lesion. The child underwent a posterior fossa craniotomy (prone position) and excision of vermian mass. He developed paraplegia in the immediate postoperative period, the possible causes for which are being discussed. Besides, treatment options for patients presenting with disseminated disease preoperatively have been highlighted. Preoperative chemotherapy to downstage such lesions may be tried and such complications could be avoided.